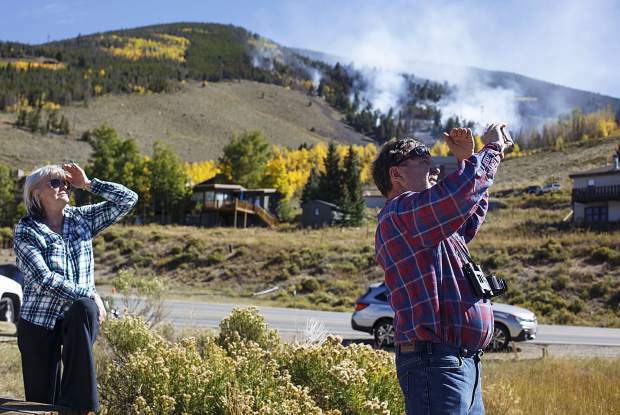 Silverthorne residents Marleen Goodman, left, and Dan Moroz take photos of helicopter action along Highway 6 by the Tenderfoot 2 Fire, Tuesday, in Dillon. People leaned against their cars on the side of the highway and watched in awe on Monday evening as the Tenderfoot 2 Fire burned just a couple hundred yards away. Helicopters passed directly above, and air tankers roared in low spraying flame-retardant slurry, giving the onlookers a dazzling show. People in Breckenridge witnessed a similar spectacle in July, watching from the balconies and front steps as the Peak 2 Fire sent 125-foot flames into the air just outside of town. It’s unusual to get such front-row seats to wildfires. But across the West, this fire season has been anything but usual, marked by extreme, unpredictable fires raging on the doorsteps of large towns and even cities like Portland, where evacuation orders for the Eagle Creek Fire came within 15 miles of downtown. Summit County’s fire season has so far fit the trend. Peak 2 forced the evacuation of hundreds of homes near Breckenridge and threatened an iconic ski town. Tenderfoot 2, while it didn’t force evacuations, was even closer to homes, businesses and infrastructure, threatening power lines, microwave repeaters, a gas line and a water plant, not to mention U.S. Highway 6 and Interstate 70. In short, they were scary, even by wildfire standards. But firefighters didn’t blink. Peak 2 and Tenderfoot 2 underscored the challenges of fighting fires in Summit County, which continues to urbanize at a time when fire seasons are growing longer and less predictable and the forests less healthy, choked with standing dead beetle-kill. Wildfires are part of a natural cycle that’s healthy for forest ecosystems. When they are remote, fire officials can use a lighter touch, letting them burn while containing from afar. In Summit County, where ninety-nine percent of the population lives within what’s called the wildland-urban interface (WUI), firefighters rarely have that luxury. Tenderfoot 2 was a small fire, only about 21 acres. But like Peak 2, it was about as close to the urban end of the WUI spectrum as a wildfire can be. And like most wildfires these days, it was burning in beetle-kill, adding fuel for the fire and risk for the firefighters. Those twin pressures — urban assets close by and beetle-killed widow-makers among the flames — demand the type of awe-inspiring air show seen Monday. But like any good spectacle, those shows are expensive. And they’re not a sure bet for putting out a fire. Given its topography, Summit County is also a very difficult place for pilots to fly. Drops have to be made very low to the ground in order to be effective, and among mountain ridges and gullies, that can be tricky. For all their usefulness, the planes can’t effectively spray every nook and cranny. Likewise, there are some patches of unhealthy forest that have just become too dangerous for firefighters. “I’m scared we’re going to get someone killed up there — not by fire but by a (beetle-killed) tree falling over,” Peak 2 incident commander Todd Pechota said in July, explaining why he wouldn’t send a crew to cut a final section of containment line. No one can say for sure whether the next fires will present these same problems. But come they will, and Hallman suspects the trend of rising severity to continue. “Where you might have had a generally wetter climate and could let things burn, when things are hotter and drier, there’s more potential for much more severe fires and scorched earth situations,” he said. For many of Summit County’s 30,000 residents, however, severity might be a secondary issue. As dusk fell on Monday night, revealing glowing embers and flames licking up the side of Tenderfoot Mountain, Dillon resident Kevin Adamson put it neatly. “This is awfully too close,” he said.